Last week, a group of 16 girls, myself and one other instructor were invited to attend the showing of the documentary film CODE: Debugging The Gender Gap. 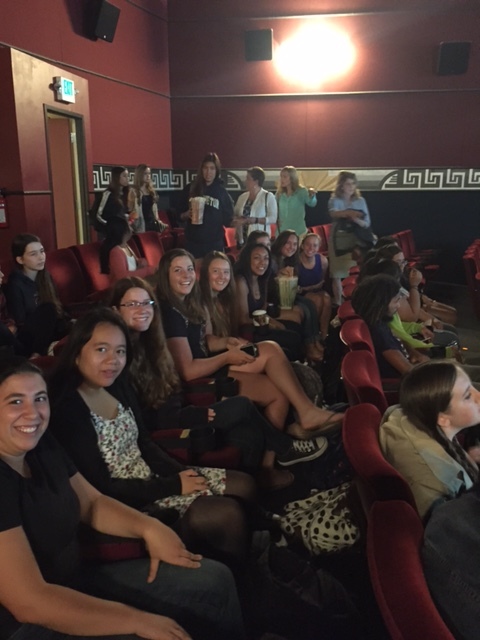 This excursion was hosted by the Mill Valley Film Festival and included a post showing discussion with the filmmaker Robin Hauser Reynolds. We traveled to the Lark Theater with another group from our neighboring high school Terra Linda. Our group represented all the currently enrolled girls in STEM courses that offer some exposure to the field of Computer Science. The Terra Linda group was composed of both boys and girls who participate in an after school “coding” club, but none of these students are actually enrolled in a course that offers them academic credit in computer science because no such course is offered at Terra Linda. Once we arrived, we sat back and watched an inspirational, sometimes shocking, movie about the state of Computer Science education and the lack of opportunities afforded young women in this ever important career field. Although there are many companies and academic institutions that are attempting to address these issues, the United States still lags behind many countries and the numbers, especially for girls and under represented populations, are still appalling. For example, according to the movie (and some quick research I conducted), only 10% of all American high schools actually offer any courses in Computer Science, and only 5% offer the AP Computer Science exam. One would think that the numbers in California must be better than the national average because, after all, we are the center of the technology boom, right? Well, according to the numbers presented by ECS and the College Board, California isn’t doing very well either: “In California, less than 1 percent of all advanced placement exams taken in 2011 were in computer science”. The shocking thing about this statistic is that since 2011, there has actually been a decline in the number of students taking Computer Science courses in high school. To make matters worse, the numbers of girls who took the AP Computer science test made up only 21% of the the original 1% of AP test takers. That’s .21% of all students taking AP tests. Of the over 320,000 AP tests taken in 2011, about 3100 were AP Computer Science, and only 650 were girls. That’s really bad, but consider that in 2011, of the 3100 AP Computer Science test takers, 29 were African American. The numbers of students being exposed to Computer Science in the San Rafael School District is somewhat typical of the national trend, but it does seem a bit strange considering our proximity to Silicon Valley. We have tech firms all around us, but so little of that energy and intellectual power seems to be trickling into the public school system. Oddly enough, its not just a problem in the public school system. Many of the prestigious private schools in Marin don’t offer robust Computer Science programs either. Terra Linda doesn’t have a single Computer Science course, and San Rafael just added one two years ago which is strictly an introductory course to the field. Neither high school offers an AP Computer Science course. The middle schools in our district are starting to offer some exposure to coding, but still are lagging far behind where they need to be. There are some reasons for this that are systemic and institutional. For so many years, No Child Left Behind emphasized Math and English to the detriment of almost every other content area. Students were enrolled in double Math and double English classes in order to get their scores up on state wide tests, and enrollment in other classes like CTE and Art declined. Another problem is teacher certification. In the state of California, the AP Computer Science class is considered a Math class, so only teachers certificated to teach Math can actually teach this course. There has been a push to change this, through a supplementary authorization, but currently in the state, even if you have a degree in Computer Science, you can’t teach the course unless you have a credential in Math. The other problem is more philosophical. I am not sure if we should be seeing Computer Science as its own separate endeavor, but rather should be seeking to integrate CS into Math and Science and Econ. curriculum. The other problem is actually due, ironically, to how financially successful a person can be if they possess a Computer Science degree (or other technical degree). Its hard for school districts to attract a teacher with these skills when they can get a job working in the tech industry that now typically have starting salaries in the six figure range. After getting off the bus, the girls were clearly affected. And I wanted them to consider doing something about it, but I wanted them to take charge. I knew their ideas would be better than mine, and so the girls got together for a post viewing meeting and discussed what they wanted to do at our school to address this problem. The other instructor and I left them alone, and they proceeded to come up with a plan. They captured their ideas and now they are set to meet with the school’s counseling staff. These girls are an amazing group of highly motivated and talented people and I have no doubt that they are going to come up with a great plan. I’ll be updating this post as soon as an official plan takes shape. I look forward to helping them debug this problem. This entry was posted in Engineering Instruction, News, STEM, Teaching, Technology and tagged Computer Science, Girls in STEM, STEM on October 21, 2015 by Steve Temple.